This paper analyzes the gang crisis in El Salvador and how the policies enacted against gangs in the United States affects the gang crisis in Latin America. Th is paper observes the relationships among these transnational gangs and the ways in which their relationships have evolved over the years. This paper also explores the recent truce between the Salvadoran regime and leaders of the main gangs in El Salvador. El Salvador is a small country in Central America with a tumultuous and bloody past. The country was locked in a civil war from 1979-1992, which ended in a stalemate and caused many casualties within the civilian population. The civil war was ended with the Chapultepec Peace Accords in 1992, resulting in a divided civilian population. The right-wing Salvadoran government maintained control of the government throughout and after the civil war. This troubled many people because the Salvadoran Army was accused of human rights violations against the civilian population throughout the course of the civil war. During the war, many people felt that the army was threatening their security and decided to flee to another country. Many of these refugees fled to the United States, specifically to Los Angeles and Washington D.C. Most of these refugees have remained in the United States because the Salvadoran government maintained control of the country after the war. Since the Peace Accords of 1992, there has been an internal power struggle between the Farabundo Martí National Liberation Front (FMLN) and the National Republican Alliance (ARENA). Recently the FMLN has gained power in the executive branch and has changed the political dynamics of the government of El Salvador. Both groups had very different ways of dealing with political and social issues, such as gang violence. The right-wing government attempted to use a heavy-hand policy in order to end gang violence, and the left-wing government attempted to use progressive change to eliminate the causes of gang violence and mitigate against the spread of gangs transnationally. When civil war broke out, Salvadoran society was already highly polarized. The exact number of the war’s civilian casualties remains unknown; however, one estimate is 75,000 civilians. In a report made by the United Nation’s Truth Commission in El Salvador, the Army was the main perpetrator of the killing of civilians.1 The Salvadoran government did not attempt to reconcile the population after the civil war, which further polarized the already divided society. Since the government was held responsible for most of the civilian casualties after the war, the people had little trust in the government. The reconciliation process was further hampered when the government refused to abide by the recommendations that were put forth by the Commission for Truth and Reconciliation in El Salvador. There was a flood of refugees who left El Salvador to escape the war, which resulted in a mass immigration to the U.S. between 1979 and 1990 of over 500,000 people; however, the exact number is unknown because many of these people came to the United States without proper documentation. The civil war ended with a peace agreement in 1992, with the government still holding legitimate control over all of the branches of government. After a self-imposed ban from government, the FMLN started running for positions of power within the government as a legitimate political party. Although this party still had direct ties to the former guerrillas, they were able to gain control of the presidency in 2009. 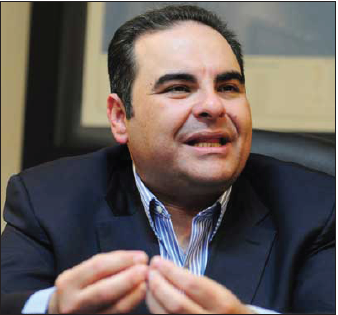 With Mauricio Funes as the new left-wing president, El Salvador saw many changes to its politics and social programs. Pandillas have existed in El Salvador for years; however, they underwent a transformation after the civil war due to the influx of criminal deportees from the United States.2 These deportees eventually formed branches of their United States gangs in Central America, and these transnational gangs eventually were known as “maras.” The word “mara” is a recent development, dating back to the 1980s, and to many people has a very sinister undertone as compared to “pandilla.”3 In El Salvador, there are four different gangs with almost 10,500 combined members.4 The main gangs are Mara Salvatrucha, otherwise known as MS-13, and 18th Street, also known as M18. These gangs are formally known as transnational gangs since they are “criminally active and operational in more than one country,” and because gang members’ actions might be planned, directed and controlled by gang leaders in another country. The criminal activities of transnational gangs tend to be very sophisticated and adaptable.5 Thus, transnational gangs are criminally active and operational in more than one country, whereas domestic street gangs, such as pandillas, are only active in one domestic region.6 There is yet another classification of these two main sorts of gangs in El Salvador: they are said to be evolving into a “third-generation” gang.7 This means that they are highly sophisticated, engage in “mercenary-type” activities, and have a fully evolved political aim.8 Branches of the MS-13 in the United States have not evolved to a third generation gang. They are still classified as a second-generation gang, which has an organizational structure similar to that of a business.9 The United States based MS-13 gangs are not considered a third generation gang because they do not have political aims or goals. Pandillas are typically classified as first or second generation because they are not as organized as MS-13 and M18, and because they do not have political aims and goals as do the maras. The contemporary idea of a mara traces its roots back to the first wave of immigrants seeking refuge from the civil war who sought refuge in Los Angeles. Most of these immigrants were undocumented, so if they were caught doing criminal activity, they would be deported back to their home country. Often these violent criminals were deported without advance warning communicated to the home governments. The problem was that most of these Hispanic immigrants felt threatened by other Hispanic gangs in their neighborhoods so they decided to create their own gangs, mostly in order to ensure their own safety.10 When the United States began to enforce immigration practices against undocumented immigrants in 1996, many of the undocumented immigrants who had been convicted of a crime were deported back to their home countries. The problem was that some of these newly deported criminals had little Spanish-speaking ability and almost no memory of the country they originally came from. They began to re-form gangs of their own within their home countries in order to feel protected again. There have been reports that the MS-13’s early membership included former guerrillas and government soldiers, and this combat expertise only added to the gang’s notoriety as a brutal and violent gang.11 Many officials receiving these new criminals blamed the United States for the escalation in violence, since these violent men were “schooled in their trade” in the United States and were contributing to crime rates.12 One law enforcement agent in the United States estimated that “all Latino immigrants below a certain age join MS-13, even as informal fellow travelers, as a matter of survival.”13 This assertion is very logical given that these young men had no other means, financially or legally, to protect themselves. 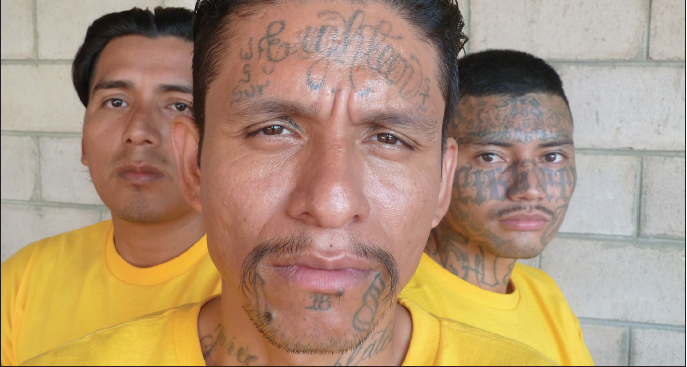 This is a photograph taken by Louis Ferrante of members of the 18th Street Gang in Izalco Prison, El Salvador. of El Salvador from 2004 to 2009.
factors known to enable gangs to broaden their base.26 It is generally acknowledged that a heavy-handed policy is not working.27 Recently non-governmental organizations are experimenting with community policing and prevention programs meant to address poverty and scarcity of opportunities. By dealing with the basis for the gangs and giving youth another opportunity, they are less likely to turn to gangs in order to further opportunities.These types of legislation are generally seen as very beneficial to decreasing the pool of recruits. The United States has played a very large role in the violence in Central America. The United States began deporting violent criminals back to their home countries, often without warning the governments of the deportees. Once there they further added to the instability and violence in the region. The United States has not succeeded in its attempts to pass a comprehensive immigration reform act, and there have been further deportations, putting additional strains on already weak Central American governments.44 The United States government is also accused of targeting MS-13 and M18 alien gang members for deportation, which has led to the further proliferation of U.S. - style gangs in Central America and Mexico.45 Most murders are committed with firearms in El Salvador, which is linked to the widespread availability of firearms.46 This can then be linked back to the United States and the lax gun regulations that permit the flow of assault weapons and other deadly firearms southward.47 Recently however, the North American Cooperative Security Act (NACSA) went through Congress. This act would increase cooperation between Mexican, United States, and Central American officials. This would aid in the tracking of gang activity and handling of deported gang members.48 Another bill has been introduced in Congress that would make gang-related offenses in the United States federal crimes and would require sentencing for all those accused. Both of these bills could aid Central American countries in their efforts to combat gang violence. In some instances, the ideas and programs are available, however funding for such groups is not available. The ties between the United States and Central America are strong when one considers transnational gang related activities. Not only are both regions facing similar issues, they are both attempting to rectify these issues. In terms of policymaking, there is significant effort by both regions to find way to solve the issue of gang violence transnationally. When comparing heavy-handed legislation versus preventative legislation, one can easily see that the preventative legislation has and will bring about the most improvement. There is still much that needs to be done, however, and if both the U.S. and the governments of Central America work together, then challenges relating to transnational gangs should be able to be faced successfully. It has been shown that heavy-handed gang legislation is not effective in containing and ending gang violence and that it is better to combat transnational gang issues with preventative measures and programs. If both the United States and Central America were to implement preventative measures, then the transnational aspect of these gangs could be severed to reduce the power of these gangs. 1 Call, Charles T. “War Transitions and the New Civilian Security in Latin America” Comparative Politics Vol. 35 No.1 October, 2002, 13. 2 United Nations Office on Drugs and Crime, Crime and Development in Central America: Caught in the Crossfire, (New York: United Nations Publication, 2007), 20. 4 Richard Millett, and Thomas Stiles, "Peace Without Security: Central America in the 21st Century," The Whitehead Journal of Diplomacy and International Relations (2008): 33. 7 John P. Sullivan, “Third Generation Street Gangs: Turf, Cartels and Net Warriors,” Crime and Justice International, vol. 13, issue 10 (November 1997). 10 United Nations Office on Drugs and Crime, Crime and Development in Central America, (2007), 20. 11The Economist, “Special Report: Criminal Gangs in the Americas,” January 7, 2006, p.23. 13 Greg Gardner, and Robert Killebrew, "Gangs, Drugs, Terrorism-and Information-Sharing," Joint Force Quarterly, no. 54 (2009): 69. 15 Programa de las Naciones Unidas para el Desarrollo (PNUD). Costa Rica,2009. Informe sobre desarrollo humano para América Central 2009–2010. San José: PNUD. 16 Programa de las Naciones Unidas para el Desarrollo (PNUD).,2009. 17 Sebastian Huhn, Anika Oettler, and Peter Peetz, "Exploding Crime? Topic Management in Central American Newspapers," German Institute of Global and Area Studies, no. 33 (2006): 26. 18 Sebastian Huhn et al, , "Exploding Crime? Topic Management in Central American Newspapers," (2006), 26. 21 Michael Shifter, "Countering Criminal Violence in Central America," Council on Foreign Relations: Center for Preventative Action, 46 (2012): 6. 22 Sebastian Huhn et al, “Exploding Crime? Topic Management in Central American Newspapers,” (2006), 26. 25 Michael Shifter, "Countering Criminal Violence in Central America," (2012): 7. 26 Office on Drugs and Crime, United Nations. Crime and Development in Central America (2007), 26. 27 Michael Shifter, "Countering Criminal Violence in Central America," (2012): 9. 29 WOLA, El Salvador's Gang Truce: In Spite of Uncertainty, an Opportunity to Strengthen Prevention Efforts, July 17, 2012; Randal C. Archibold, “Gangs’ Truce Buys El Salvador a Tenuous Peace,” New York Times, August 27, 2012. 30 Ana Arana, “How the Street Gangs Took Central America,” Foreign Affairs, May/June 2005. Joaquín Chávez, “An Anatomy of Violence in El Salvador,” NACLA Report on the Americas, May/June 2004. 31 CRS interviews conducted in El Salvador, August 20-22, 2012. 33 U.S. Department of State, INL, International Narcotics Control Strategy Report (INCSR), Vol. 1, March 2012. 35 Richard Millettet all, "Peace Without Security: Central America in the 21st Century” (2008): 32. 36 Liana Wyler, "International Drug Control Policy: Background and U.S. Responses," (2012): 9. 37 Archibold, Randal. "U.S. Stands Firm Against Drug Legalization, Biden Tells Region." The New York Times, New York Edition edition, sec. A6, March 05, 2012. 39 Sebastian Huhn et al "Exploding Crime? Topic Management in Central American Newspapers," (2006): 7. 43 Michael Shifter, "Countering Criminal Violence in Central America," (2012): 21. 44 Gloria Goodale, “LA’s Latest Export: Gangs,” Christian Science Monitor, February 10, 2006. 45 United Nations Office on Drugs and Crime, Crime and Development in Central America: Caught in the Crossfire, 26. 46 Michael Shifter, “Countering Criminal Violence in Central America,” (2012): 21. 47 Clare Ribando, "Gangs in Central America," (2005): 5. Altschul, Francisco. "El Salvador's Quest for Equitable Growth and the 20th Anniversary of the Peace Accords." The Ambassadors Review, Spring 2012, 32-34. Archibold, Randal. "U.S. Stands Firm Against Drug Legalization, Biden Tells Region." The New York Times, New York Edition edition, sec. A6, March 05, 2012. Brysk, Alison. "Democratic Reform and Injustice in Latin America: The Citizenship Gap Between Law and Society." The Whitehead Journal of Diplomacy and International Relations . 9. no. 1 (2008): 55-69. Cruz, Jose. "Criminal Violence and Democratization in Central America: The Survival of the Violent State." Latin American Politics and Society. 53. no. 4 (2011): 1-33. The Economist, “Special Report: Criminal Gangs in the Americas,” January 7, 2006, p.23. Fagan, Craig. "Perspectives on Urban Poverty in Latin America." Urban Update: Comparative Urban Studies Project Policy Brief. no. 4 (2004): 1-4. Franco, Celinda. "The MS-13 and 18th Street Gangs: Emerging Transnational Gang Threats?." Congressional Research Service Report for Congress . (2008): 1-24. Gardner, Greg, and Robert Killebrew. "Gangs, Drugs, Terrorism-and Information-Sharing." Joint Force Quarterly. no. 54 (2009): 68-73. Huhn, Sebastian, Anika Oettler, and Peter Peetz. "Exploding Crime? Topic Management in Central American Newspapers." German Institute of Global and Area Studies. no. 33 (2006): 1-42. Killebrew, Robert. "Criminal Insurgency in the Americas and Beyond." Prism 2. 3. (2011): 1-20. Millett, Richard, and Thomas Stiles. "Peace Without Security: Central America in the 21st Century." The Whitehead Journal of Diplomacy and International Relations . (2008): 31-41. Narich, Richard. "Traditional and Non-Traditional Security Issues in Latin America: Evolution and Recent Developments." Geneva Centre for Security Policy Occasional Papers. no. 42 (2003): 1-20. Office on Drugs and Crime, United Nations. Crime and Development in Central America: Caught in the Crossfire. New York: United Nations Publication, 2007. Ribando, Clare. "Gangs in Central America." Congressional Research Service Report for Congress . (2005): 1-6. Seelke, Clare. "El Salvador: Political and Economic Conditions and U.S. Relations." Congressional Research Service Report for Congress . (2012): 1-24. Seelke, Clare. "Gangs in Central America." Congressional Research Service Report for Congress . (2012): 1-23. Shifter, Michael. "Countering Criminal Violence in Central America." Council on Foreign Relations: Center for Preventative Action. 46. (2012): 1-59. Sørensen, Ninna. "The rise and fall of the "migrant superhero" and the new "deportee trash": Contemporary strain on mobile livelihood in the Central American region." Danish Institutie for International Studies. no. 22 (2010): 1-24. United Nations Office on Drug and Crime, . World Drug Report 2012. Vienna: United Nations Publication, 2010. Wyler, Liana. "International Drug Control Policy: Background and U.S. Responses." Congressional Research Service. (2012): 1-42. Wilkerson, Michael. "Security and Democracy in El Salvador: An Undeniable Connection." Stanford Journal of International Relations. 10. no. 1 (2008): 32-41. Katie Baugh is a senior from Fairfax, Virginia. She is majoring in International Relations and German with a minor in Economics. Upon graduation, she intends to pursue a Masters in Political Science with a concentration in International Security. She would like to thank Professor Jason Weidner for his support and guidance throughout this project.